Within Buddhism, Guanshiyin Bodhisattva holds a very important position. Some people say that Guanshiyin Bodhisattva is Chinese and some say he is a Westerner; some say the Bodhisattva is male and some say female. 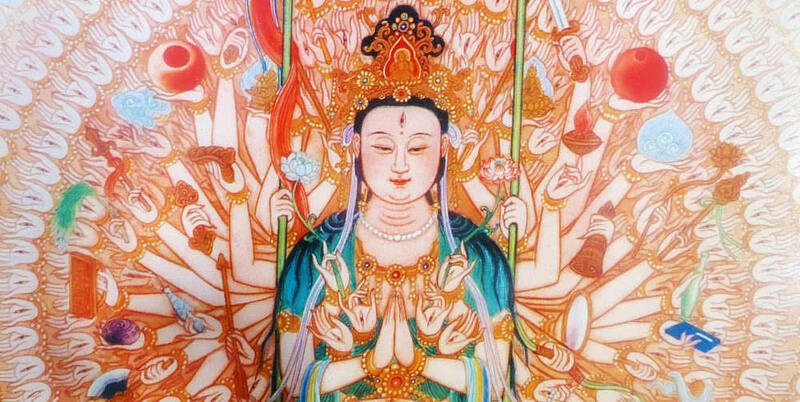 But now I am informing all of you that Guanshiyin Bodhisattva is neither Chinese nor Western, neither male nor female. Well, then, where does he come from? He fills empty space and pervades the Dharma Realm; he is in every place and yet not in any place. He appears according to what kind of body is needed to save each particular category of beings. He manifests in whatever physical form is appropriate to speak Dharma for beings; thus his identity is flexible. Guanshiyin Bodhisattva appears in the form of a Buddha to save those who are ready to become Buddhas. He appears as a Bodhisattva to save those who should become Bodhisattvas. He appears as a heavenly king to speak Dharma for beings in the heavens. Within Buddhism, Guanshiyin Bodhisattva is one who goes about everywhere teaching and transforming living beings, inspiring them to bring forth the Bodhi mind. He first sees what a particular being likes and then makes them happy with what they like. Once they are happy, they will like to listen to the Dharma he speaks and gradually he will be able to rescue them. That's why I say that Guanshiyin Bodhisattva is not necessarily male or female; he could be male or he could be female. In any case those are just transformations. As to Guanshiyin Bodhisattva's own body, he is in a state of unmoving Suchness —he is just like the Buddhas. Anyway, Guanshiyin Bodhisattva already became a Buddha a long time ago, by the name of Right Dharma Brightness. He simply appears as a Bodhisattva in order to teach and transform living beings. In Buddhism, he appears as a Bodhisattva; in other religions he often appears clad in white robes. In Christianity, he is the Holy Mother; he appears as the Holy Mother to teach and transform a certain category of beings. He appears in white robes and Christians call her Mother Mary, but actually she is Guanshiyin Bodhisattva manifesting in that form to inspire beings to bring forth a resolve that will lead them sooner or later to understand the Buddhadharma. Once they understand the Buddhadharma, they will bring forth the resolve for Bodhi. These are the endless miraculous functions and inconceivable states of Guanshiyin Bodhisattva. Guanshiyin Bodhisattva uses kindness, compassion, joy, and giving to save all living beings. He saves beings from the seven difficulties, responds to two kinds of seeking, has fourteen kinds of fearlessness, speaks Dharma in nineteen ways, and has thirty-two response bodies. If childless people seek sons or daughters, their wishes will be granted. These are the two kinds of seeking. Therefore, in a Guanyin recitation session, any vow can be fulfilled and any result can be obtained, because Guanyin Bodhisattva responds to all requests. You may seek to leave the home-life, to remain a layperson, or to become a Buddha. Guanshiyin Bodhisattva has great kindness and compassion, and will not disappoint you no matter what you ask for. He'll definitely fulfill your wishes. Therefore, during the Guanyin session, you may seek whatever you like. Whether you seek a son, a daughter, wealth, or long life, you will be able to obtain them. But these are forms of happiness subject to "outflows"; you ought to seek the nonoutflow happiness of Buddhahood. Worldly riches, honor, and glory all come to an end, but nonoutflow happiness is endless and infinite. Let's recite Guanshiyin Bodhisattva's name more in order to realize an everlasting fruition. If you are mindful of Guanshiyin Bodhisattva, he will be mindful of you. You recite Guanshiyin Bodhisattva's name hoping that he will compassionately save all beings; he recites your name hoping that you can leave suffering and attain bliss, be free from disasters and sickness, cancel offenses and create blessings. He hopes you will increase in Bodhi and perfect your mind for the Way. We shouldn't let Guanshiyin Bodhisattva down. He is so compassionate and mindful of us, we ought to set everything else aside and concentrate on reciting his name. If we can do that, he will definitely be with us whether we are moving or still, awake or asleep. He will aid us, destroy our karmic obstacles, and make our good roots grow. Having received Guanshiyin Bodhisattva's aid, we should strengthen our resolve for Bodhi and advance vigorously without slacking off for a moment. We shouldn't chatter so much. If you decide not to talk, eat, or sleep, that's fine; but don't fail to cultivate. Everyone has to cultivate. We should regard every moment and every day as a Guanyin session. In fact, we should wish to cultivate the inconceivable Dharma door of reciting Guanyin Bodhisattva's name every month, every year, and every great eon. Don't think that you're free once the session is over, because you are not truly free unless you become enlightened. So don't entertain the thought of retreating. We should all be wishing for another Guanyin session so we can continue to develop our skill. Why should we recite Guanshiyin Bodhisattva's name? It's because he made vows in the past that if people have much greed, much anger, or much stupidity, and if they constantly recite his name and worship him, their greed, anger, and stupidity will disappear even before they realize it. They will forget about these poisons and think instead of samadhi and precepts. And so, if we constantly recite and venerate Guanshiyin Bodhisattva, not only will our greed, anger, and stupidity vanish, but we will be safe from all disasters. If we enter a blazing fire, we will not be burned. If we fall into deep waters, we won't drown. That's how incredibly powerful his name is! If we can recite Guanshiyin Bodhisattva's name for a full seven days, we will gain inconceivable merit and escape all misfortunes. Now, if you're not afraid of trouble, then you don't have to learn anything. If you fear trouble, then you should study the Buddhadharma and learn to recite Guanyin's name. If you don't want to recognize yourself and you say, "I'm a nobody, so I don't need to be mindful of the Buddha, the Dharma, and the Sangha," then you'll soon turn into a ghost, since you don't want to be a person. At that time you can still recite Guanyin's name. Guanyin Bodhisattva doesn't abandon you when you become a ghost. Ghosts can recite Guanyin's name, and so can animals. If you're in the hells, you can recite his name as well. You can recite in any of the three evil paths, so don't think you'll be doomed. That's why it's called the Wonderful Dharma. Guanshiyin Bodhisattva's state is inconceivable. If you recite his name in the three evil paths, you will leave suffering and attain bliss. All of you should go home and cross over your own hell-beings, hungry ghosts, and animals. If you can cross over the suffering beings in your own home, you are practicing the Bodhisattva Way. "Do such beings exist in my home?" you ask. By your home, I mean your own mind. Your greedy thoughts, angry thoughts, and stupid thoughts are living beings in the three evil paths.